More than 40 youth were recognized for their achievements with Scouts Canada during a ceremony Friday night at city hall. Hiking up a mountain in the freezing rain, Nurin Amlani was slipping and sliding. She lost her footing and fell. She picked herself up from the cold, muddy ground to continue the trek in her soaking wet clothes. After seven years with Scouts Canada, she wasn't going to give up. Staying the course on the overnight camping trip in Jasper last winter was one of accomplishments that helped Amlani, 13, earn a Chief Scout Award, with which she was presented Friday night during a ceremony at city hall. More than 40 youth from across northern Alberta were recognized for their achievements with Scouts Canada during the event. Lt.-Gov. Lois Mitchell was on hand to deliver the honours. Mitchell said talking to the youth makes her feel good about the future of the province. "I think what these people mean is hope," Mitchell said. "When you talk to them, you realize they're leaders in their own right already." Amlani, a member of the 40th Edmonton Scouts, is following in the footsteps of her older brothers, Khalil and Rasul. Both also have their Chief Scout Awards and have since earned Queen's Venturer Awards. 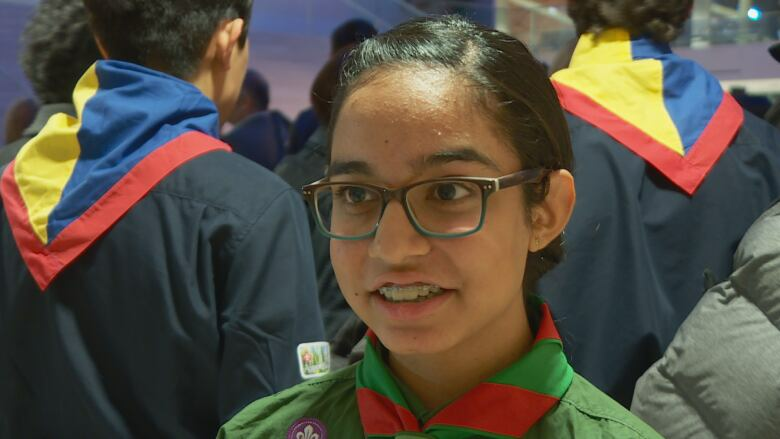 "It gives me more encouragement to go in their path and to succeed like they did," said Amlani, who plans to continue with the organization and become a Venturer and then a Rover. She said she has learned things she would not have otherwise. For example, she can deliver first aid, one of the skills she's most proud. "For example, if someone's hurt, just on the street, I know what to do," she said. Amlani said being a Scout has broadened her horizons. "It makes you realize what this world needs," she said.